This year is the first time in ages I have been really excited about Christmas; there are several factors in this: (1) I have finally finished everything to do with my PhD, so I don't have that hanging over me; (2) my son is at an age where he is really excited about Christmas and it's rubbing off on me, and (3) I have three yarny advent calendars to open over December! The first Advent calendar is one that I made for myself using all the mini skeins I have lying around my house. There are also some little sweet treats in there, woo! All the skeins from this calendar will be added to my sock yarn blanket. The second Advent calendar is the Painbox Yarns Advent Calendar, which I won at the The Flock party I went to at the start of November. It contains 24 little (10g) balls of Paintbox Yarns DK, and I still haven't decided what I'm going to do with them; they are really cute as they are though, so as a temporary measure I'm going to put them in a Kilner jar, and if I totally run out of time I'll thread them all onto a long piece of yarn and hang them as bunting! If they're lucky I might manage to knit or crochet them into cute mini stockings for the Christmas tree. The third Advent calendar is a bonus. Last weekend Love Knitting discounted their Opal Advent Calendars, and while I didn't think I could quite justify it, my husband did by buying it for me. It is HUGE! And my son is very interested in the box, so it might have to be hidden in a couple of days to avoid probing fingers. The calendar contains twenty-four 15g balls of Opal sock yarn, so they're also going to be added to my sock yarn blanket (which will be almost doubling in size this month if I keep up). Here's day one, look at all the lovely yarn. I also have lots of other knitty plans for December, including finishing my son's Christmas jumper, which just needs a couple more seams, pupils and a neckline. Should be done in time to see Santa at the weekend. 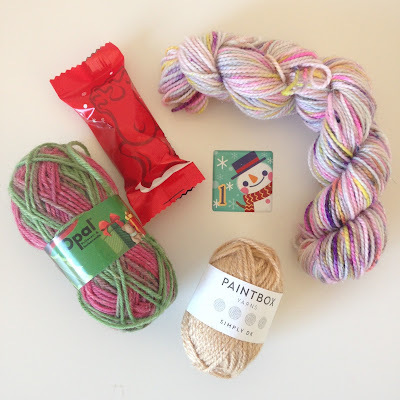 Does anyone else have a yarn advent calendar? Or some other exciting calendar? I have seen candle, tea and stationery options this year (I would have loved the stationery one when I was small)! Glad to see you are excited about Christmas and have so many plan for the holidays. Your son’s jumper seems to be coming along well. Have fun and happy knitting! This was from last Christmas - I'm not quite crazy enough to be excited about this year's Christmas celebrations yet, we're still on summer holidays here! I'm pretty sure I'll have to knit my son a new jumper for this year, he seems to grow rather too quickly!